At last, a tale worthy of the scrapping loner with the chiseled hairstyle, the brooding nihilism, and the badboy muscles. 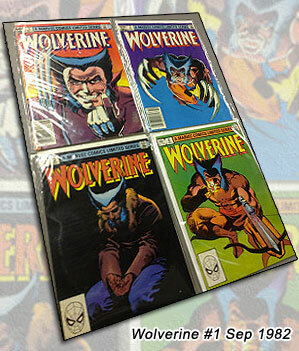 Mining stellar source material – the 1982 Volume 1 comics series Wolverine (Imagine Games Network gave this four-part volume a “Must Have” rating) – the filmmakers could not go wrong. By much. You see, they’ve borrowed the characters from that story – but neglected its thematic grist. The comic is a quagmire of conundrums: a man trying to prove his love by rescuing his woman from dishonor, beleaguered by fragile events that continually paint him as dishonorable, a tale of betrayal, honor, treachery, and long shiny claws. The movie focuses on the long shiny claws. THE WOLVERINE finds our favorite adamantium-laced astro boy in reclusion, in the Canadian Rockies. Memories of WWII haunt Logan: imprisoned in a Japanese prison pit, seeing the A-bomb dropped on Nagasaki, using his regenerative body to shield the blast from a young Japanese soldier, Yashida. (He’s got his bone claws in this scene, which will feature later at a very opportune moment.) Now in the present, set in a post-X-MEN era, Logan has grown weary of his burden of “immortality” (the healing factor that keeps him non-aging); he is nihilistic, almost fatalistic, yet a sliver of honor keeps him dragging his feet forward into the world. A vermilion-haired emissary of Yashida, Yukio (Rita Fukushima), tracks down Logan, finding him in a bar, exacting justice on a callous hunter for a wounded bear. “Why did you go into that bar if not to seek justice?” Against his wishes, she hauls his v-shaped torso to Japan for a final meeting with his long-lost war acquaintance. Yashida (Haruhiko Yamanouchi) is on his death bed, now a billionaire, kept alive by technology that would make Steve Jobs slash his wrists with a wrist-slashing app. Yashida makes Logan an offer: transfer Logan’s healing powers to Yashida, thereby making Logan mortal and Yashida virtually immortal. “You are ready to die. I am not.” And no matter how much he has whined about his healing x-factor, and outliving his girlfriends, and being a berserker in battle because he has nothing to fear from injury, it is at this point that the Wolverine in Logan surfaces and he figures, hey, it ain’t such a bad thing after all, never having to sign up for Obamacare. He huffs out of the room under the sensual gaze of a red-headed nurse, who would later turn out to be another mutant – Viper (Svetlana Khodchenkova). (Geez, you can’t swing a cat in these Marvel movies without hitting somebody with freaked-out genes.) Viper surreptitiously implants a “crawler” in Logan’s body that nullifies his healing powers. Logan attends the wedding of Yashida’s daughter, Mariko (Tao Okamoto, so slender we wonder where she puts her intestines) to ambitious businessman Shingen (Hiroyuki Sanada, supercool not just for being a Toshiro Mifune lookalike, but also for giving Tom Cruise a bitchbeating in THE LAST SAMURAI). The names might be familiar from the comic, but the characters have very different textures in the movie. By marrying Mariko, Shingen lays claim to Yashida’s empire upon his death, so the last thing he wants is Yashida gaining immortal genes. He shoots enough sinister glares at everyone until ninja warfare breaks out. Meanwhile, Logan is trying to decide between white meat (Viper) and yellow meat (Mariko). Or maybe x-meat (in numerous hallucinations, waking next to Famke Janssen – and that can never be a bad thing, although in his fantasies, why is she still wearing that nightie?). Before he nocturnally emissions, he is swept up in an assassination attempt during the wedding, and flees with Mariko, taking a few bullets in the skirmish. 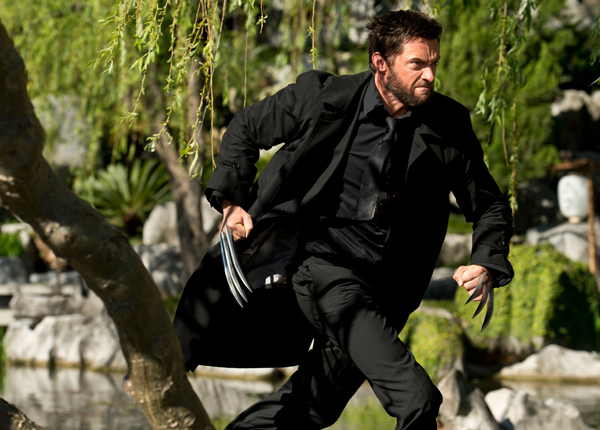 Now usually, Logan would heal right up and continue the forward thrust of berserker claws. This time, he is rocked backwards dizzily, blood loss, no healing – something rotten in Denmark. As with all modern superhero movies, his “power” – his very essence – is riven from him. Teetering on the edge of normalcy – a mighty topple for a once-super being – Logan is beset on all sides by Mariko’s assassins. Movie hardly stops for a breath, and for once, we feel the exhaustion the hero feels as one fight sequence blurs into the next, Logan barely finding the time to put his shirt back on before he has to rip it off again for a body-oiled beatdown. Sorry, I didn’t mean to CLAWS a disturbance. We’ve grown inured to battles atop moving vehicles, from stagecoaches, to cars, trucks and trains (SPIDER-MAN 2), even a creative horse stampede battle (ABRAHAM LINCOLN VAMPIRE HUNTER). WOLVERINE ups the ante with a battle atop the Japanese bullet train! Fans created many Japanese-themed posters like this one. And an early teaser “motion poster” featured Wolverine on a rooftop with a katana, rain beating down. 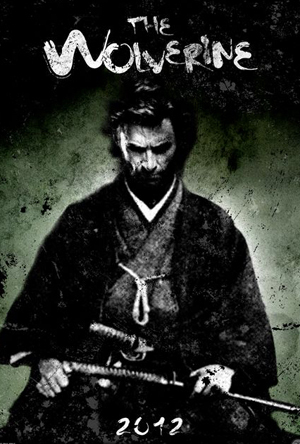 If the movie had emulated this legit ronin vibe, there would have been nothing to complain about. 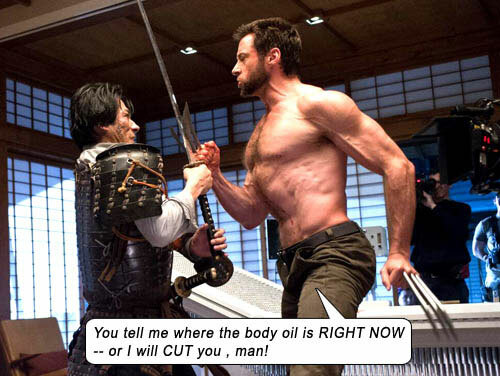 In the comic, Wolverine dreams of being pierced by numerous arrows, an emasculation metaphor; the movie takes Kurosawa’s THRONE OF BLOOD approach, and brings down Wolverine with quiver-loads of real arrows. Then movie engages its own emasculation metaphor, as Viper coaxes Wolverine’s claws from their sheaths as he is restrained on a table – to try and steal his steel for Yashida. Production values excellent, action throat-grabbing, suspense heart-curdling; overarching storyline is the only dereliction, as the filmmakers flensed all the political and moral gravity from the original tale and merely made it a road trip about Wolverine – like Austin Powers – just trying to get his mojo back. Being typecast as Wolverine couldn’t’ve happened to a nicer guy. Hugh Jackman has become the most recognized face for a superhero since Chris Reeve as Superman. And the stinger on this film promises us the mysterious Canadian special forces mutant will be back, bone claws akimbo. That’s good, because they still haven’t answered the most pressing question of all: Are those sideburns or a half-beard? 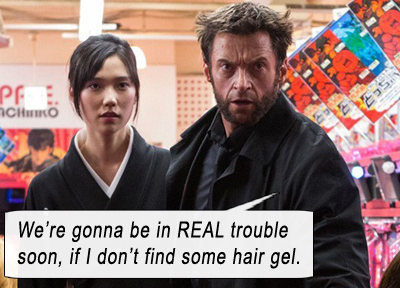 Starring: Hugh Jackman, Tao Okamoto, Rila Fukushima, Hiroyuki Sanada, Svetlana Khodchenkova, Brian Tee, Hal Yamanouchi, Will Yun Lee, Ken Yamamura, Famke Janssen. The original Wolverine character was at war with his inner berserker. Nick Lowe’s The Beast In Me coincidentally perfectly outlines that dichotomy. Wolverine is one of those few characters for which the Hulk’s admonition works perfectly, “Don’t make me angry. You wouldn’t like me when I’m angry.” The best-defined characters are at war with themselves, not just superheroes (Batman, Spider-Man) but also Eastwood’s avengers (Harry Callahan, William Munny) and even anti-heroes like Tony Soprano and Walter White. (Lowe’s song was used as one of the thematic hooks in THE SOPRANOS). Wolverine is a touchstone for this trope – like all of us, he knows what is right and wrong, but sometimes he just can’t help himself doing the wrong. Though he has isolated himself from humanity, he still feels impelled to enter that bar “to right a wrong.” If the movie had steered into this curve, it would have been infinitely darker, but it chose to stay away from too much introspection, instead robbing Wolverine of his physical “powers” to create suspense. When I first read the Chris Claremont/Frank Miller masterpiece, I thought it was well into the character’s history, not just due to the well-structured story and morally-shifting plot, but because of the maturity of Wolverine as a character. Though relatively new to the comics world (developed 1974), the ex-special forces x-man with the adamantium claws and constant inner monologue seemed as fully formed as the most popular heroes of that generation. But as the nomenclature denotes, that was his first solo outing in comicdom. As a jarhead might intone: Outstanding!